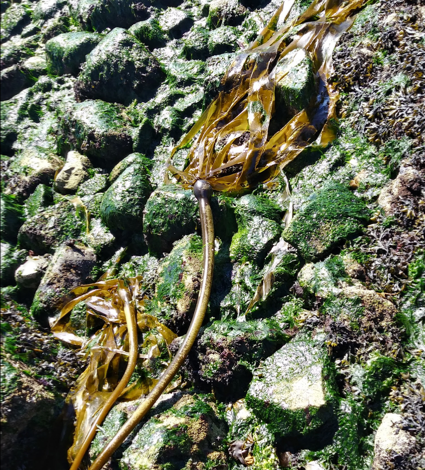 Recently, I started an exciting project—to use my knowledge from university and combine it with what I have learned on-the-job to create seaweed education resources. It began with an idea to create a new presentation about seaweeds in the Salish Sea and has since branched out in many directions! I am researching some of the most common local seaweeds and seagrasses, along with their traditional uses by Coast Salish First Nations. Once I collect enough information, I will create a formal talk about seaweeds—similar to our octopus presentation—as well as have other seaweed-themed activities. We aim to have seaweeds in the centre for visitors to touch and learn about. To begin, I headed out with fellow Educator, Aneka, and explored a nearby beach looking for seaweeds! We found many intriguing species—most of which I had learned about in a course at Bamfield Marine Sciences Centre! Aneka had never seen many of them before and it was fun to teach a coworker about a topic I have become passionate about. Above left to right: Turkish Towel (Mastocarpus spp. ), Rockweed (Fucus distichus), Bull Kelp (Nereocystis luetkeana) and Sea Lettuce (Ulva spp. ), and Sea Noodles (Sarcodiotheca gaudichaudii). On July 14, I had the chance to share my newfound seaweed knowledge at the CRD's Marine Day at Witty’s Lagoon. Arriving early we collected a variety of seaweeds—similar to what we want to have at the centre—for people to touch and learn more about them. On the beach, we helped identify creatures and taught people about beach biodiversity. This experience gave me a ‘taste’ of outreach and outdoor education. It was a fun challenge explaining topics and identifying species we don’t see every day in the aquarium. Curious people passing by allowed me to practice mini seaweed talks throughout the day. We received a lot of questions about both traditional and common uses of seaweeds. 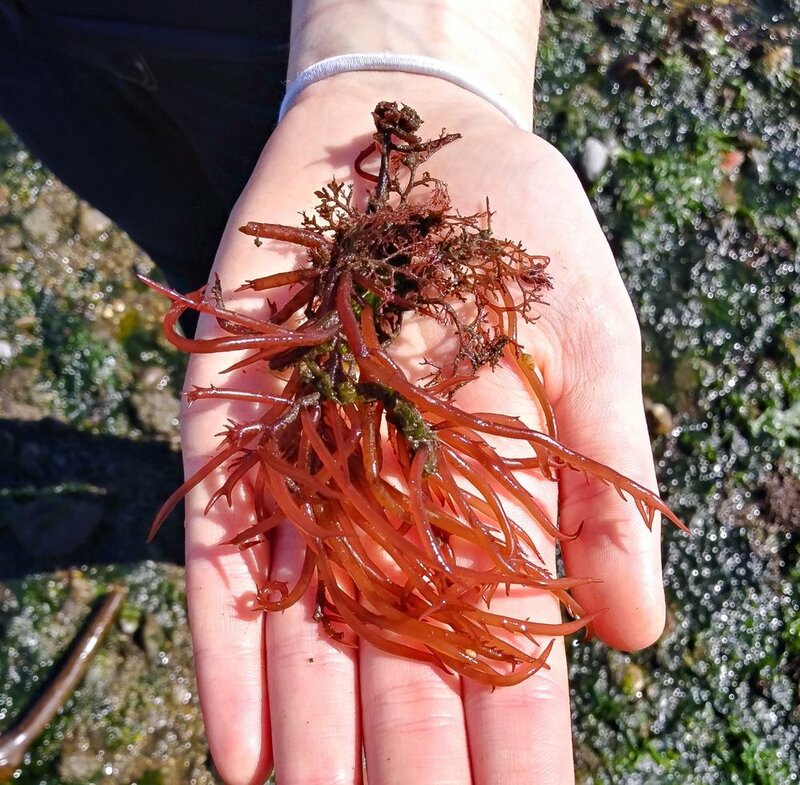 Most people were surprised to learn almost all seaweeds in the Salish Sea are edible—although some may taste better than others! One man started munching on a blade of seaweed as soon as I said it was edible, which was pretty awesome! Learning more about Coast Salish First Nations has been a very rewarding experience. When I began this co-op work term and I mentioned to my supervisor I would love to learn more about Coast Salish cultures, she went ahead and gave me the freedom to do so with this side-project and I am very grateful. In a biology degree, there is little opportunity to explore First Nations culture and traditions. However, it is important to recognize that First Nations culture is a key part of Canada and incorporating traditional ecological knowledge into our scientific knowledge gives us a more complete view of the natural world. If you want to learn more about seaweeds come by the aquarium soon to touch and learn about some local seaweed species, or just come talk to me! I am always excited to share what I’ve learned about the weeds of the sea! 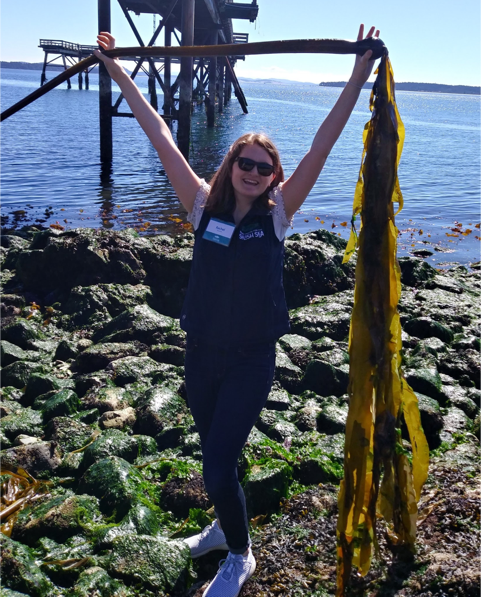 Update: Since Rachel's blog post was completed, she has hosted a drop-in touch and learn table with seaweeds collected from Sidney's Glass Beach and re-purposed some of those seaweed samples into specimens for our Microscope Monday feature. Seaweed is also cool when magnified!